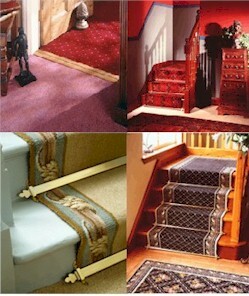 Stair Rods (USA) have been manufacturing carpet accessories for over fifteen years. During this time we have constantly innovated in all areas, designing, developing and introducing new products. We design and manufacture all our stair rods in-house, meaning the entire process is handled by ourselves and we have full control over everything to do with our business. We concentrate entirely on stair rods as we don't do anything else - this guarantees that our products are the best available anywhere in the world.